A Brilliant Young Mind is an overly sentimental film that wants us to feel for its characters but uses shortcuts and time jumps instead of interactions to give them any kind of connection. To begin with we have a pretty traditional narrative starting point with Nathan (Asa Butterfield), a kid genius with touches of autism who doesn’t connect with the people around him very well. 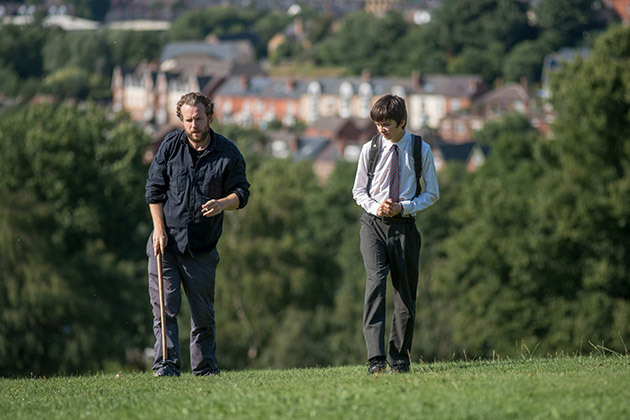 Partially this lack of connection is due to his autism and because his father died in a car accident when he was young so now he just has his mom Julie (Sally Hawkins) and a former math prodigy, now bitter teacher, Martin (Rafe Spall) as his tutor. Nathan is obsessed with getting on the British team for the International Mathematics Olympiad, and seems to have little else he cares about. When Nathan’s father dies it happens so early in the film that while, yes, losing a parent is hard, there is no setup to the relationship to explore why he cares about his dad and seems basically indifferent to his mother. We get some flashbacks with Nathan and his father but we are expected to care about this relationship without giving us anything early on to let us know what Nathan’s connection is to his father in preference to his mother with whom he is distant so that the death becomes an event, not a place to build Nathan as a character. After his father’s death he meets Martin and then we jump ahead several years and never see Nathan and Martin’s relationship develop, we just know that it did. Considering this movie was almost two hours long and is built to be a journey for Nathan in discovering connections with people it is odd that the two people he has had the most interaction with are treated like nonentities. There is a half-hearted attempt to give Martin some personality with him having a physical aliment that is weakening him, and by trying to involve him in a relationship with Julie. Sadly neither one of these points are given any time to develop. The physical battle is given a few lip service moments and then forgotten, and we are given even less with the romantic relationship so that you wonder what was the point. Hawkins as Julie has little to do but worry about Nathan and she shows emotion well because she is Sally Hawkins, but really it is a nothing role that doesn’t use her to any real significance. Most of our time is spent with Nathan as he deals with trying to make the team and interacting with those around him. Nathan likes his food to be cut a certain way and also wants his food be a prime number in amount, doesn’t like holding hands and has trouble talking to people. Despite this he attracts the attention of two girls, Zhang (Jo Yang) who is on the Chinese team of the Mathematics Olympiad and Rebecca (Alexa Davies), a member of the British team. Besides it seeming random that someone who doesn’t talk much gets two girls to fall for him, I will say the chemistry is there. While one feels more likely for Nathan, the film does leave open that both are possibility for him for different reasons and are realistic options for Nathan. Through it all though there was little I could think of that kept me engaged overall with what was happening. We see Nathan spend time with Zhang in Singapore, he talks with Rebecca, and he vaguely interacts with some of his fellow Olympiads including one who also has autism and often comes off like a jerk. Yet Nathan as a character really isn’t that interesting, and watching people studying math isn’t that engaging of a way to spend time. As mentioned before, this kind of storyline, the brilliant child missing a parent trying to get by with a mentor, feels easily like plot points we have heard before, which is fine, but to make that all work we need something else to make us care. That’s where the characters are supposed to come in but director Morgan Matthews is not able to give the time to these people that they need. Nathan and Zhang’s walking around and being kids did give them some ground that I was interested in but everything else about Nathan’s math obsession or missing his dad never really delivered in a way that worked. We know it is there but there is nothing to explore. This is a well meaning film that wants us to feel sympathy for its characters but then doesn’t want to give them the time or effort to make them characters. Instead we get “problems” in place of personality and it becomes tiring after a while and really doesn’t build to anything that we haven’t seen before that was done better. The kids have some cute moments but it doesn’t justify the length of time we spend with them.